After my bad fall last December I’ve been thinking a lot about how to make winter riding safer. The first step was to install studded snow tires for both wheels. My fall was caused by only having a snow tire on the back wheel; my front wheel slid out from under me when I was going downhill at 20mph with my daughter on the back of the bike (she was unhurt). There is no good reason not to wear snow tires during winter. My tires of choice are the Schwalbe Marathon Winters, which are designed for icy pavement rather than deep snow. Another safety factor is simply learning to recognize danger. Some conditions are more dangerous than others. Just before my fall last December I had ridden five miles without incident. It was only when I turned onto a new road that things became dangerous. The new road was recently plowed and the shoulder had a thin layer of innocent-looking slush. Unbeknownst to me the slush hid a layer of ice that was my undoing. I’ve since learned to recognize this “killer slush” and avoid it. 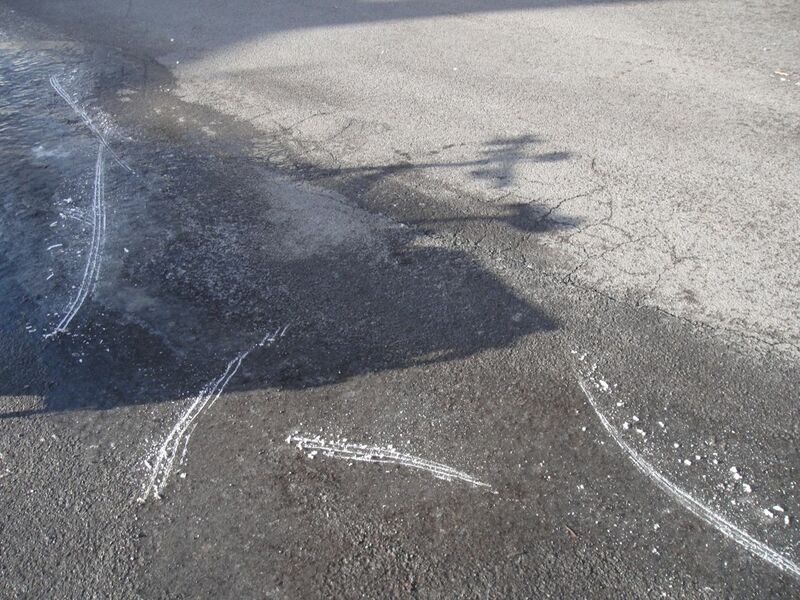 Another danger to watch out for is of course the legendary “black ice” (see photo above) which is caused by melting snow forming puddles which then turn into patches of ice in unexpected places. Now when I ride in the winter I periodically set my foot down to test the slipperyness of the road. If it’s too slippery I either walk my bike or resort to “outrigger mode” (described in the last paragraph). After my fall I imagined all sorts of technological fixes that would enable bikes to handle snow and ice better (see some of my sketches below, and see http://www.ktrakcycle.com/ for a seemingly successful commercial product). Could bikes have anti-lock brakes? Apparently motorcycles do, and electric bikes already have the electricity and the computing power that is required. Could bikes have roll bars? How about caterpillar treads? I also wondered whether a trike would be less likely to flop over when it encountered ice. I made a lot of sketches of trikes, and contemplated Xtracycle to trike conversions. I imagined outrigger wheels that could perhaps fit into the Xtracycle H-rack mounts and prevent a bike from falling over, kind of like giant training wheels for adults. However, someone I know who rides a trike says that in the same situation as my fall a trike would probably flip over rather than lay onto its side. I scuttled my plans for constructing outriggers until I was riding with my son Jasper last week in packed-snow conditions. The going was so difficult that he simply stuck out his legs, planted his feet on the road and let the motor move him along. It struck me that here are the outriggers I was looking for—our legs! They were right here all along at the end of our torsos. So for riding on packed snow I recommend lowering your seat, taking off your toe clips, letting some air out of your tires, taking your feet off the pedals, and taking off. This style of riding wouldn’t have been possible without the advent of electric motors for bikes. Now how about roller-shoes for pavement or ski-shoes for deep snow?